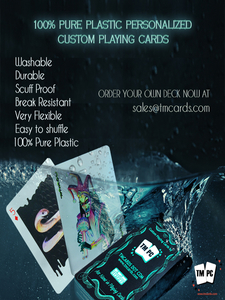 Here is another interesting choice of playing cards from TMCards: 100% Pure Plastic playing cards. These are durable and long lasting compared to regular playing cards that are available in the market. These 100% plastic playing cards do not crease, rip or tear as easily as paper cards. They are even better than the paper playing cards which are coated with plastic. And obviously a better option compared to playing cards that are completely made out of paper. You can wash these plastic cards with a damp cloth when they get dirty and begin to stick together. And these plastic playing cards slide very easily on any playing surface.